Hand Print Jewellery and Footprint Jewellery for Christmas? Things are hotting up in Impressions HQ with hand print jewellery for Christmas. So many of you would like something a little more special and sentimental this year and Impressions to Keep jewellery seems to fit the bill! There is so much to choose from! 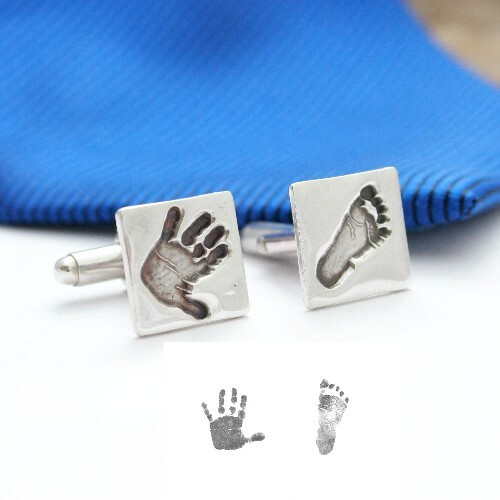 Hand and footprint cuff links, pendants, charms or Pandora style beads with your child’s real prints on the silver jewellery. All hand crafted, high quality using pure or sterling silver and stunning! There is something for everybody – Gifts for Dad, gifts for Mum and gifts for anybody who has been particularly good this year! The prints are taken using a special ink less wipe kit, which is part of the jewellery cost and posted to you so that you can take the prints in the comfort of your own home. The images are scanned & emailed or posted back to me to work on making your hand print jewellery or foot print jewellery. It takes a little while to get the kit to you and for you to then take the prints and send to me. Because of this, please add a couple of weeks to when you need your order! So, for orders to be safely with you in time for Christmas, the ‘last orders’ bell will clang on 2 Dec and prints need to be back with me by the 10th.